Built by General Motors, Eastern Aircraft Division. Delivered to the United States Navy (USN) as TBF-1C Avenger bureau number 45946. Assigned to the U. S. Marine Corps (USMC) to squadron VMTB-134. No known nickname or nose art. On November 10, 1944 took off piloted by Major Harry V. Scullin on a mission over Palau. This Avenger crashed in shallow water off along the southern end of the Ngeregong Island. Postwar, the remains of Muller were recovered and transported to the United States for permanent burial. This Avenger crashed into shallow water off the southern end of the Ngeregong Island. 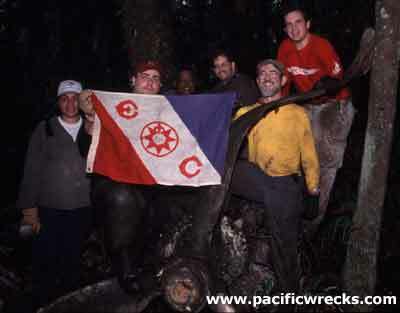 On November 12, 2001 Pat Scannon / BentProp and the P-MAN-III team, with the help of Palauans on Ngeregong, relocated this crash site. 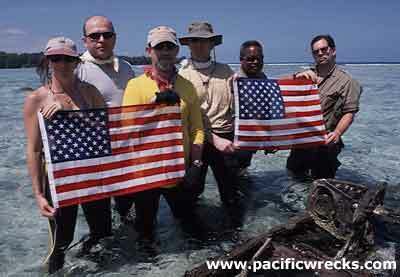 The entire crew was officially declared dead the day of the mission. The entire crew earned the Purple Heart, posthumously. Postwar, Muller was buried at Fort Snelling National Cemetery at plot C, block 13794. Scullin and Smith remain listed as Missing In Action (MIA). Both are memorialized on the tablets of the missing at Manila American Cemetery. Scullin also has a memorial marker at Jefferson Barracks National Cemetery at section MB, site 158.